Large amount of pre-installed software. Acer's Aspire ZS lineup of all-in-one computer systems has been discontinued and are no longer available for purchase. The company still continues to produce a wide range of all-in-one just not with the same style. If you are looking for an all-in-one system, be sure to check out our Best All-In-One PCs for more up-to-date options. 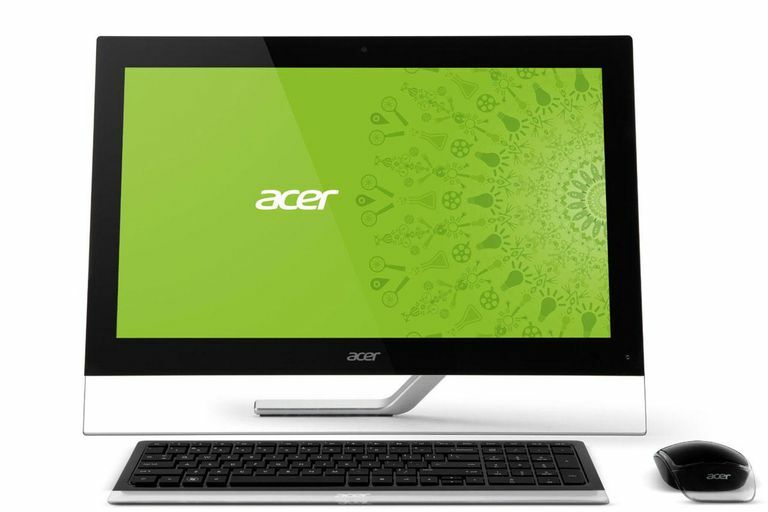 January 7, 2012 - Acer's latest revision of their Aspire Z all-in-one seems to just be the past model with a new processor installed and the Windows 8 operating system. It would have been really nice to see Acer put more effort into upgrading different aspects of the system including a faster hard drive or more memory. At least it still retains the HDMI input and output ports that make it slightly more useful as a small media center device. Pricing is also on the lower end which still makes it affordable but it doesn't have much to set it apart from the competition. 22.2" x 17.1" x 2.3"
Even though the Acer Aspire ZS600 is a new model number for the Z series of all-in-one PCs, it is essentially identical in appearance to the previous Aspire Z5700 model released a year ago. In fact, there is pretty much no external changes to the system as it features the same types and number of peripheral ports as the previous model. One of the changes to the system is the move to the Intel Ivy Bridge-based processors that offer better efficiency. They still use a low-level Intel Core i3-3220 dual-core desktop processor and just 4GB of DDR3 memory. This is sufficient for the average user that will be mainly using the system for browsing the web, watching video, and maybe some productivity applications. It would have been nice to see them upgrade to 6GB or 8GB of memory to allow a bit smoother experience but Windows 8 does do a good overall job and keeping the switching between applications quite smooth. Storage features remain completely unchanged from the past model. It still retains a one terabyte hard drive that provides a good deal of storage but this is pretty typical of just about ever all-in-one system on the market. The only downside here is that they still use a 5400rpm spin rate drive that is a bit slower at things look booting into the operating system or launching applications than the more traditional 7200rpm based drives. If you do need additional space, there are two USB 3.0 ports for use with high-speed external storage. They still reside on the left side of the display rather than the back which would be more useful for external storage drives that are constantly connected. A dual layer DVD burner is included for playback and recording of CD or DVD media. The 23-inch display panel is still the same version that was used in the past Aspire Z series systems. It features 1920x1080 native resolution for full support of the 1080p high definition video format. The screen does offer multitouch support which is actually much more useful now that Windows 8 is built around the interface. It offers a decent picture with good overall viewing angles but it is limited in the vertical angle due to the kickstand for the system. The graphics received a slight upgrade to the Intel HD Graphics 2500 from the newer processor but they are still extremely limited in terms of 3D performance. While it may not be used for gaming, it does provide accelerated media encoding with Quick Sync compatible applications. It would have been nice if it used the Core i3-3225 which offers the same processor speed but a faster Intel HD Graphics 4000 graphics core. Pricing for the Acer Aspire AZS600-UR308 remains similar to what the past model was sold at with street availability of around $850. This makes it one of the more affordable of the Windows 8 touchscreen based all-in-one PCs. The closest systems in price are the Gateway One ZX6980 (also from Acer), HP's Envy 20 TouchSmart, Lenovo's IdeaCentre B540 and Toshiba's LX835-D3300. The Gateway One is a very similar system but slightly more affordable as it uses a Pentium G645 processor and half the hard drive space. HP's uses a smaller 20-inch display with lower resolution but offers 6GB of memory and a faster hard drive. Lenovo's IdeaCentre B540 is very similar but uses an older Sandy Bridge processor in exchange for a faster hard drive. Finally, Toshiba's LX 835 uses a mobile processor for a bit less performance but comes with more RAM, a faster hard drive, and better-integrated graphics.